I’ve said it before, and I’ll say it again: Thank god for the playoff. By Thursday night I felt like shouting it from the damn rooftops. Thank god for the playoff! Just imagine where we’d be right now without it. If college football’s postseason were still under the thumb of the late, not-at-all-lamented BCS, America would have spent Thursday afternoon watching Ohio State and Oregon in what amounted to a trumped-up consolation game in the Rose Bowl, while looking forward to a winner-take-all, no-questions-asked collision between Alabama and Florida State for the national title.1 Read that sentence again, and consider how deeply absurd it is that college football operated that way for 16 years. Hell, for a long time a lot of people argued that the assorted, decentralized forces that run the sport would rue the day they stopped operating that way. But most of us always knew better, and the results of the inaugural semifinal round proved us right. Under any arrangement, relegating the Ducks and Buckeyes to purgatory would have been frustrating; as the seconds ticked away on New Year’s Day, it became clear that was the most obtuse scenario any system could have conceivably produced. But that was the order of the day before the playoff: maximum possible stupidity. Instead, the inaugural playoff let two eminently worthy outfits that would have been shut out under the old system prove their mettle in compelling and decisive fashion. Oregon, looking very much like its usual, methodical self against Florida State, racked up 639 yards of offense and outscored the defending champs 41-7 in the second half of a 59-20 rout. Ohio State, a nine-point underdog against Alabama, spent the evening pushing the no. 1 team in the nation around the Superdome in a wild affair that, statistically speaking, wasn’t nearly as close as the 42-35 final suggests. Those two games had everything,2 from big plays to dramatic swings in momentum to serious schadenfreude. Most importantly, they gave the Ducks and Buckeyes the chance they deserved to ascend to the final level while leaving no doubt that they belong there. Where we were once resigned to consolation, we were now treated to a coronation. Aside from an unforced, uncharacteristic interception at the end of the first half, Mariota was as unflappable against Florida State as ever, ultimately accounting for 400 yards of offense and three touchdowns in a little more than three quarters.3 As eviscerations go, it was (as usual) a relatively quiet one, so smooth and seemingly effortless that the dagger — specifically, back-to-back touchdown passes to Darren Carrington in the third quarter that extended the Ducks’ lead from five points to 19 points in less than three minutes — went virtually unnoticed until the final, decisive thrust. In the end, Mariota against defending national champion FSU was indistinguishable from Mariota against a Pac-12 also-ran like, say, Washington or Utah. The only thing we don’t know about Mariota at this point is where precisely to hang his portrait in the pantheon of great college quarterbacks, which will be determined by how he goes out in his final game4 and whether he’s enshrined with a national championship, the only line missing from his already sterling résumé. It’s not hard to rattle off a list of great, Heisman-winning quarterbacks who had the rug pulled out from under them with the title on the line — see Gino Torretta, Chris Weinke, Eric Crouch, Jason White, Troy Smith, Sam Bradford, et al. — and subsequently saw their legacies diminished before they even left campus. All told, Mariota’s career has already surpassed all of the above. If he goes out hoisting a trophy, the universal goodwill he’s built up over the last three years will extend in a way it has for very few others in recent memory. By contrast, Mariota’s counterpart in Arlington, Ohio State’s Cardale Jones, remains a veritable tabula rasa. After his two starts in place of injured phenom J.T. Barrett, all we can say for certain about Jones is (a) he’s huge, checking in at a Roethlisbergeresque 6-foot-5, 250 pounds, and (b) he has no misgivings about putting the ball up for grabs downfield, especially in the vicinity of wide receiver Devin Smith, whose performance in the Sugar Bowl only reaffirmed his reputation as the most lethal long-ball threat in the nation. Jones was especially icy against Alabama on third-and-long,5 completing five of eight attempts for 153 yards and a touchdown on a 47-yard bomb to Smith in the third quarter; Jones also converted a pair of third-down opportunities as a runner, much to Nick Saban’s chagrin. Then again, Jones also committed his first big mistake, a second-quarter interception that led to Ohio State falling into a 21-6 hole, and took a couple of near-disastrous sacks in the vicinity of his own goal line. He often looked erratic, though that’s to be expected from an alarmingly green quarterback facing a Saban defense. Still, given the flimsy sample size on Jones and his apparent penchant for boom-or-bust caprice, it’s anyone’s guess what to expect from one game to the next, especially when the stakes keep rising. Even taking the Buckeyes’ quarterback shuffle into account, Oregon and Ohio State remain very similar offensively in terms of both philosophy and production. They’re balanced: Against FBS opponents, the Ducks and Buckeyes were the only Power 5 attacks that eclipsed 3,000 yards rushing and passing, and the only Power 5 attacks that averaged at least 7.0 yards per play. They’re explosive: After Thursday, Baylor is the only Power 5 team with more plays that gained at least 30 yards. Both sides rely on big, versatile workhorses (Royce Freeman for Oregon, Ezekiel Elliott for Ohio State) to shoulder most of the load on the ground, while neither side has felt any need to establish an obvious, go-to receiver. Both sides rank among the top five nationally on third-down conversions. On the scoreboard, the upset over Bama marked the 10th time Ohio State has exceeded 40 points, a barrier Oregon has now cleared 12 times. On paper, anyway, the only relevant distinction between the offenses is Oregon’s aversion to turnovers: Thanks to Mariota’s paltry interception rate, the Ducks have committed fewer giveaways (10) than any other FBS offense, and thanks to Florida State’s outpouring of generosity in the Rose Bowl, Oregon can also claim the best overall turnover margin in the nation. The Buckeyes have turned it over more than twice as often. As the Seminoles learned the hard way, Oregon has a way of compounding the interest on its opponents’ mistakes in short order. When Chip Kelly was promoted to head coach in 2009, Oregon boasted exactly one top-five finish in school history (in 2001) and only three conference championships in the previous 50 years. The balance of power on the West Coast rested unquestionably with USC, owner of the previous six Pac-10 titles. From there, the Ducks won three consecutive outright conference championships in Kelly’s first three seasons, played in four consecutive BCS bowls, and beat USC three times out of four. The 2010 team led the nation in total and scoring offense en route to the first undefeated, untied regular season in Oregon history. The 2011 team won the first Pac-12 championship game, then won the Rose Bowl for the first time in 95 years. The 2012 team eclipsed 2010 records for yards and points per game and landed at no. 2 in the final polls. Oregon won more games in those three seasons (36) than any other program in the nation. 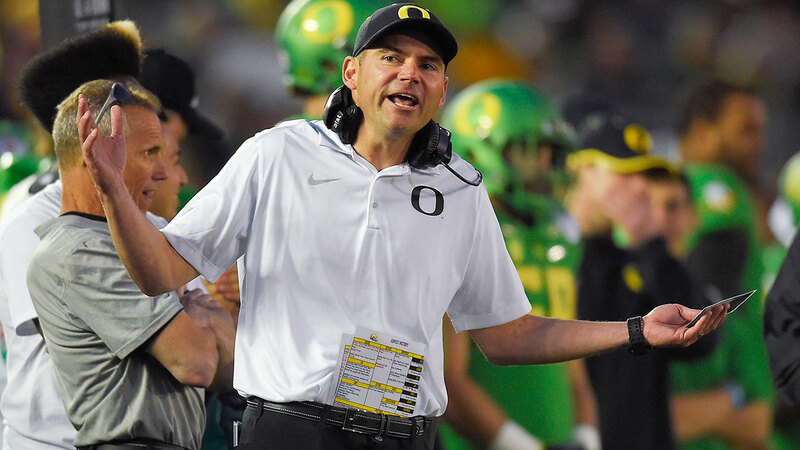 The only superlative Oregon didn’t claim in that span was its first national championship, a seemingly quixotic mission that was bequeathed to Kelly’s handpicked successor, Mark Helfrich, when Kelly graduated to the NFL in 2013. For the nouveau riche in college football, the last step is the hardest: If Oregon wins in Arlington, it will be the first school to claim its first national championship since Florida in 1996, capping two decades’ worth of sustained investment and growth and finally taking its place at the top of a sport that has traditionally viewed the Ducks as fringe players, at best, and more often as laughingstocks. If not, fans will look toward a future without Mariota and another year removed from Kelly, and inevitably begin to wonder if the window has closed. When Urban Meyer landed in Columbus, Ohio State was coming off a disheveled, 6-7 2011 campaign and heading directly into the teeth of NCAA sanctions. Over the ensuing three years, the Buckeyes have gone 37-3 overall (25-1 in Big Ten play), and with Meyer’s recruits having nearly displaced Jim Tressel’s throughout the depth chart, the team has just vanquished the notion that Ohio State is a rusty regional power destined to come up short outside of the hidebound Big Ten. Mentally, physically, and statistically, OSU matched and eventually surpassed the SEC champs on every front. Between the Sugar Bowl, Michigan State’s dramatic comeback against Baylor in the Cotton Bowl, and Wisconsin’s overtime win against Auburn in the Outback Bowl, Thursday was the best day for Big Ten football in a long, long time, and one the league desperately needed in the face of its long-suffering national rep. (Jim Harbaugh’s messianic arrival in Ann Arbor only added to the feeling of a forthcoming renaissance.) If Ohio State claims the title, it will be the B1G’s first since Tressel’s Buckeyes upset Miami to cap the 2002 season, and it will place Meyer alongside Saban and Pop Warner as the only coaches ever to win national championships at two different FBS schools. By turning Ohio State into an ornery Rust Belt version of its ostensible Southern nemesis, though, Meyer has already detonated one of the overarching narratives of the past eight years and helped put an entire league back on the map. The gap between FSU and Oregon would have been small, but simulations concluded that the Noles would have come in at no. 2 if the BCS formula were still in place. Well, unless you’re still clinging to the notion that defense wins championships, which … no, not anymore, it doesn’t. Mariota didn’t record any stats following his 23-yard touchdown run early in the fourth, and he was pulled for Oregon’s final three series of the game. No one seems to be indulging the pretense that Mariota might return for his fifth and final year of eligibility in 2015. Defined as third down and six yards or more to go.